You know the feeling akin to spotting a long lost friend when you see certain things at the supermarket. And then buying them in large quantities just to have the comfort of having it on hand when you may need it. You may of course not use all of it, but it is good to have these in abundance in your pantry. The strange looks the person at the billing counter gives you as she eyes the cart is absolutely fine. The spouse's quizzical looks don't matter much either. As long as you can get these home, sigh in pleasure, think about all the wicked ways you can have with it. You use some and then after some days, look at it with a frown, furiously browse your favorite cookbooks and blogs for a recipe - the classic case of buying too much and then racking your brains about how you will put them to the best use before the product expires! At least some of us do this most of the times I guess. I am very definitely guilty of doing this! In our country, we hoard, not because we are greedy or anything, we just don't want to be in a situation (life and death, goes without saying) where we want to cook or bake something desperately and 'this' thing does a disappearing act.. again.! for months! And oddly enough, most recipes you want to try during this period feature this absconding ingredient. The referent here is fresh cream. I like to use Amul cream, specially the small 200 ml packs. I find them very convenient to make just that bit of ganache or to go into an ice cream or pasta. Annoyingly, it has this strange habit of periodically disappearing off the shelves. Along with its family member, mozzarella (another fav product of this brand). On one of my grocery shopping expeditions, I ended up buying quite a lot of these handy tetra packs of cream. And had a couple of precious packs to finish before the expiration date...life and death situation again, undoubtedly! An unexpected visit to a friend's home for a meal, had me volunteering to make dessert (my most favorite part of a meal to cook and to eat both). Friend doesn't eat eggs and is not a raving fan of chocolate. Not very easy for me as I first think eggs and chocolate or at least one of them when I think dessert! 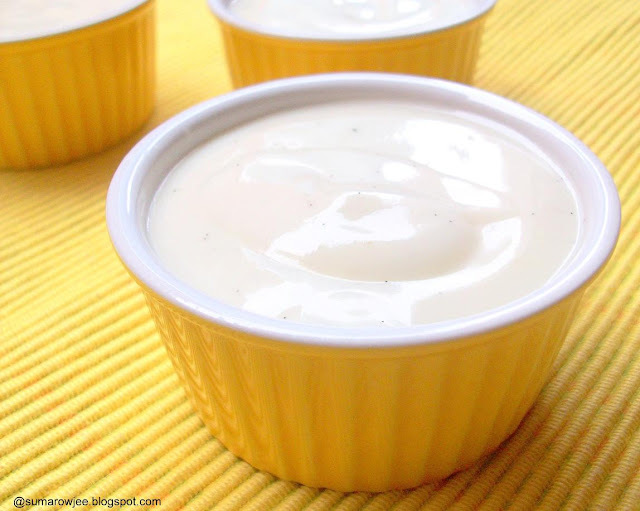 Uhh, how about a subtle, creamy vanilla bean pudding? Inspired by the Vanilla bean pudding on Smitten Kitchen, I wanted to try an egg less version of it. 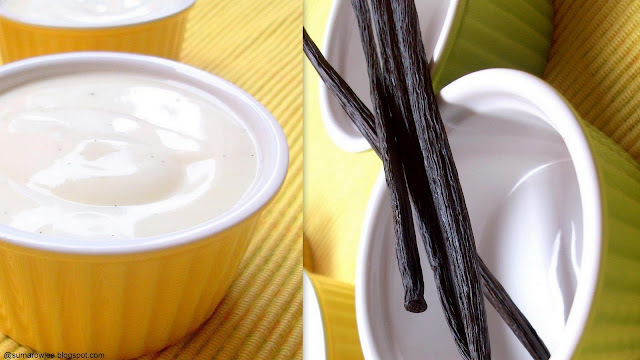 Good vanilla beans at home, thanks to Deeba, made this a very tempting, quick dessert to try. But had to get the richness, texture without using eggs. And no, not too much of cornstarch as I do not favor the texture it brings. Cream of course! 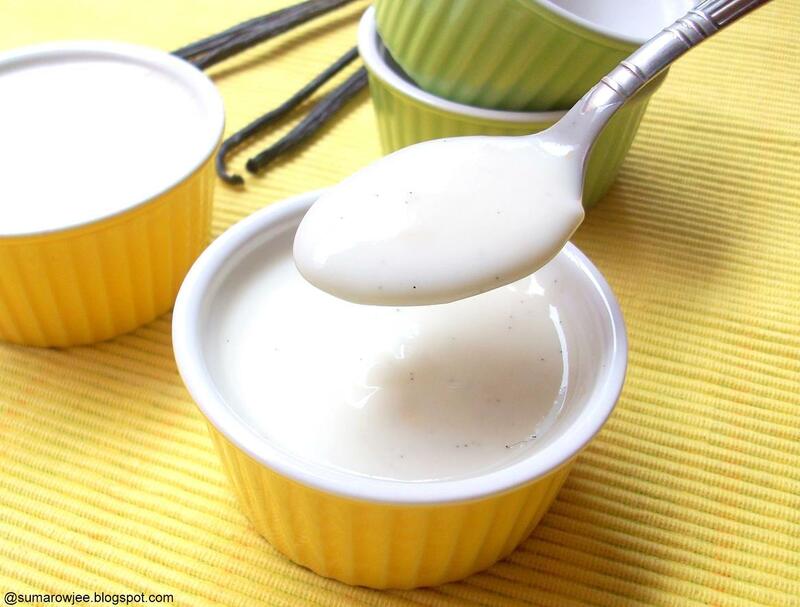 So, here is my version of the Vanilla bean pudding, which is subtle, really easy, quick and delicious, a convenient make ahead one as it thickens with refrigeration. And tastes even better the next day... or is it my imagination? The below quantity makes enough for about 6 generous servings. Procedure: In a heavy bottomed saucepan, whisk together the milk and cream till well combined. Add the sugar. Scrape the vanilla bean and add it to the milk and cream mixture, bring to a boil. Stir to dissolve the sugar. Turn off the heat. Allow to cool slightly. (At this point, you could cover and allow the flavor to infuse for an hour or so if time permits) In another small bowl, whisk the cornstarch with the remaining half a cup of cool milk. (if the milk is hot, the starch may become lumpy). Whisk well to make a smooth mixture. Add to the milk and cream mixture little by little, whisking constantly. On medium heat, cook for about 5 minutes, whisking constantly as it thickens. The pudding will coat the back of a spoon. Turn off the heat. The pudding will be quite thick now (but not very much so) and will thicken further as it cools. When cool, add the vanilla extract. Let the bean remain in it till you pour the pudding into individual serving bowls. Chill for at least 4-5 hours or overnight before serving. This makes a just about sweet, creamy dessert, which tastes like vanilla ice cream, but with the texture of pudding of course.. 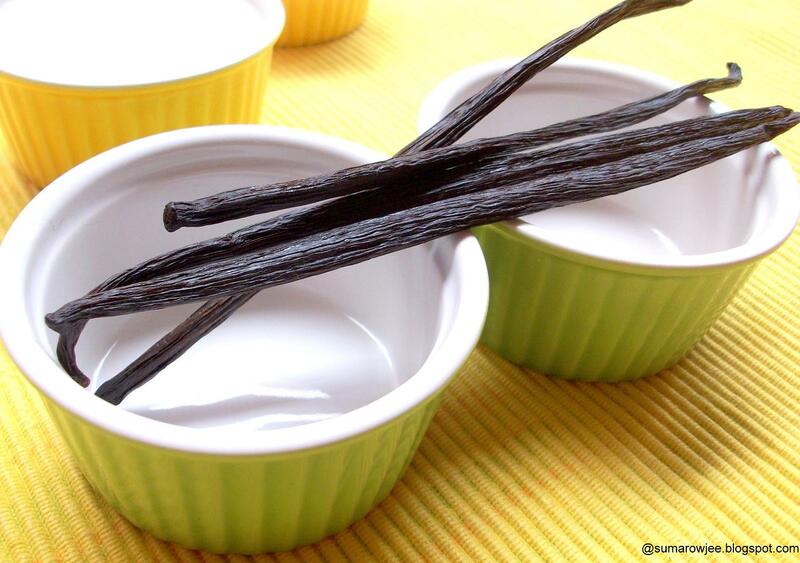 Please note : Make sure you use good vanilla beans and extract to get the best of flavors. Full fat milk certainly gives the pudding texture and body. Low fat milk will not give the same results. If you use low fat milk, you may need to use more cornstarch, which I personally do not prefer, taste and texture wise. If you do not have vanilla beans on hand, you could use vanilla essence, but again, it will be nice, but not quite as rich in taste, so I would not recommend it very highly. Enjoyed the write up and those ramekins are beautiful !!! Sounds like a lovely dessert ! Seriously cant take my eyes from ur irresistible click,super tempting and delicious pudding. looks simply mouthwatering!! looks lovely!! i too love baking! just started a blog!will post more recipes soon!!!!! your version looks so rich and creamy! 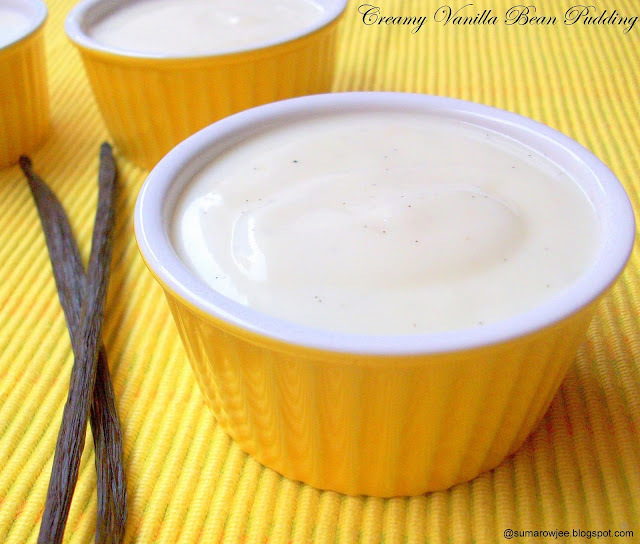 I have few vanilla beans in my pantry..its tempting me to try! could u please tell me where do we get ramekins in Bangalore,I have been searching for long. Even though I'm here in the U.S., where ingredients of all kinds aren't awfully hard to come by (well, especially if one is willing to pay a lot for them, I mean), I can completely relate to the situation you describe. I love your description of the process of buying the items, bringing them home, and pondering how you might use them in recipes. That's just exactly what I do as well. Your photos are gorgeous! Wonderful blog you have here. Thanks for dropping by Suma!! The pudding looks so creamy and rich. Loved the use of vanilla beans..
Lovely dessert. Can you tell me where you got those ramekins in Bangalore? Looks good to me...better than good. Love how creamy and vanillaeeee it is! YUM! !